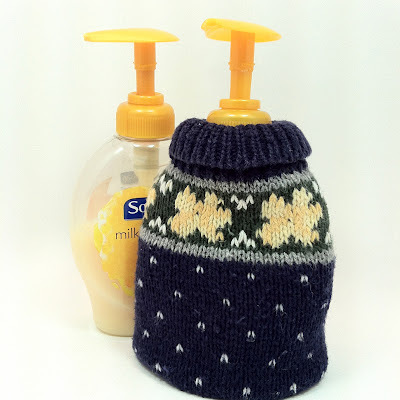 A quick and easy craft project using a sweater sleeve and a rubber band. From inspiration to finished product in under 15 minutes! 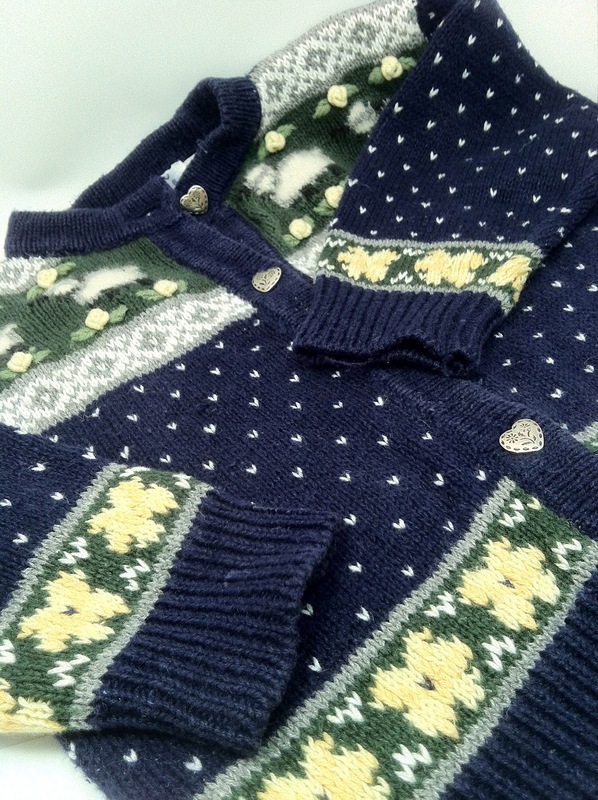 I just can’t stop making stuff out of Thrift Shop sweaters. I like to use liquid hand soap but the ho-hum (ugly) bottle on my sink really bothers me. I’m just too lazy – oops, I mean BUSY – to decant it into a prettier container. But today, inspiration struck. I couldn’t pass up this cute little girl’s sweater at the Thrift Shop. I figured it was worth it for the buttons alone. Today I cut off the sleeves, and dressed up my sink tops with a little “slipcover” for my liquid soap dispenser! 1. Lop off the sleeve of a sweater. Cut it MUCH longer than your soap bottle. 2. Slip it over the bottle with the cuff at the top. 3. Secure it with a rubber band around the screw cap part of the pump. 4. Fold the cuff down and arrange it nicely. 5. 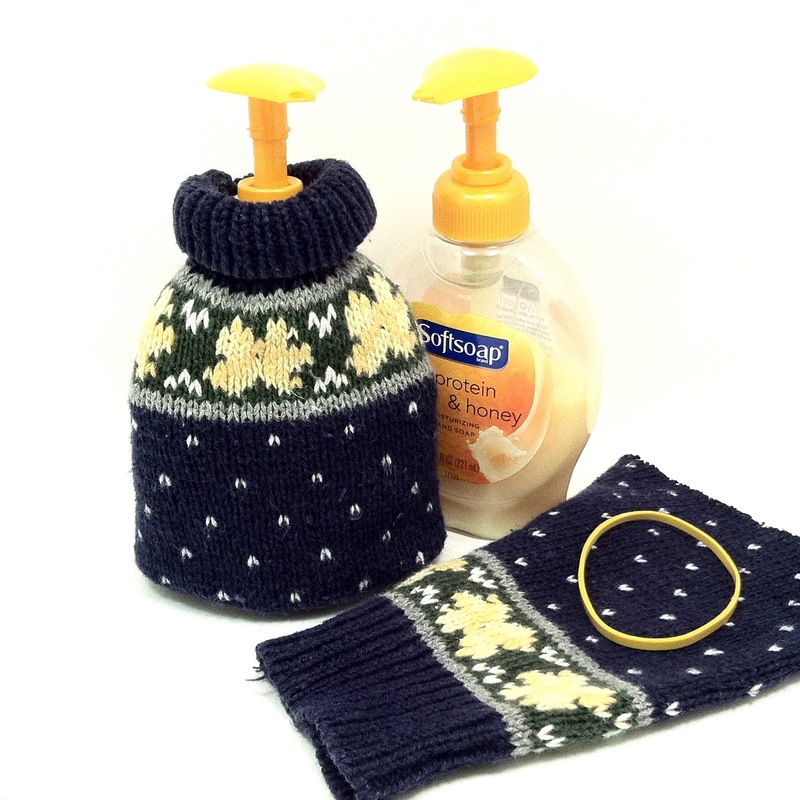 Here is where you will need to make some decisions based on the thickness and pattern of your sweater. I was planning on gluing or stitching a hem for the base and that is still a fine idea. But I decided to simply turn it under with a generous hem so that the raw edge tucked nice and flat all the way up to the design on the sweater. That way, if the edge made a bump, it would be camouflaged. That’s all! How simple…. And best of all, when it gets yucky, just throw it in the laundry and slip it back on.